We would like to pay our dandavat pranams to the many devotees who worked very hard to make Srila Gurudev's visit a great success. We would especially like to thank Sripad B.P. Janardan Maharaj, Hasya Priya Prabhu, Sarvabhavana Prabhu, Srutasrava Prabhu, Sanatani Didi, Suresvari Didi, Swarnangii Didi  and many more. For seven months in 2004-2005, this community was graced by the holy visit of our Srila Gurudev, Srila Bhakti Sundar Govinda Dev-Goswami Maharaj. This website serves as a record of these days and is humbly offered for his satisfaction, dedicated to him and to the devotees worldwide. 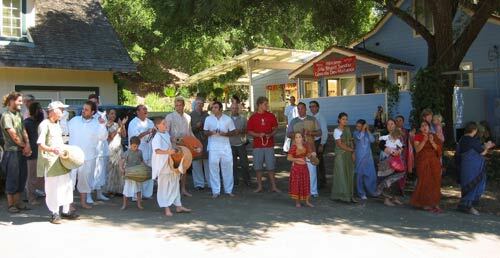 Srila Govinda Maharaj, the Sevaite President Acharyya of Sri Chaitanya Saraswat Math, was again in California during November 2007, as part of his 23rd World Tour. For more information about Srila Govinda Maharaj and Sri Chaitanya Saraswat Math, please visit www.scsmath.com.